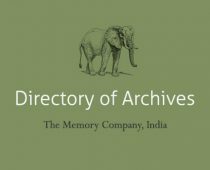 Archival collection of early printed literature, commercial art in Bengali and Assamese from 1800-1950 as well as visual documents such as photographs and modern academic art. Documents, records, Correspondence, Photographs, of Colonial historical (British Empire) importance along with the History of Bengal. The Roja Muthiah Research Library (RMRL) was founded to preserve & expand the collection of Roja Muthiah Chettiyar, a private collector who put together one of the world’s finest private libraries of Tamil publications.